To diagnose some health problems, doctors often check your fingernails. Healthy nails are pink, while some illnesses cause different colors, characteristics or marks to show up on your fingernails. A nail bed that is purple may be an indication of many illnesses, including a lack of oxygen in the body. 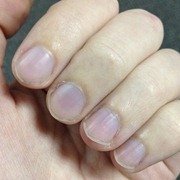 Poor circulation can cause purple fingernails. If your fingernails are purple and tingling, they may not be getting enough blood. Because blood that has plenty of oxygen is bright red, blood that is darker in color may not have enough oxygen. If you smoke, you may have purple fingernails because the body becomes deprived of oxygen and takes it from areas such as your fingers. If only one fingernail is discolored, you may have had an injury and broken blood vessels beneath the nail. This keeps the blood from flowing as it should and is called a subungual haematoma. Although this sounds very serious, it simply means you have a bruise under your fingernail. A small hole could be made in the nail to relieve the pressure, but this is not a good idea as it can leave your fingernail op to infection. If you experience severe pain, you should contact your doctor. Anyone who is anemic, meaning they have low levels of iron in their blood, can develop purple fingernails. This happens because the blood is not oxygenated as it should be. Taking an iron and vitamin C supplement each morning can help with absorption. If your fingertips tingle or are discolored, you can try heat and massage to increase the circulation. This is much like shaking your foot when it goes to sleep. Another way to increase circulation would be to use a small ball to squeeze throughout the day. If neither of these tips work, contact your doctor before the problem becomes more serious or life-threatening.